TheGardenLady loves to visit gardens. Spring is here and the urge is back. A number of years ago, TheGardenLady created a tour of gardens of England for myself and garden lover friends- this is not a business that I do, just a labor of love. 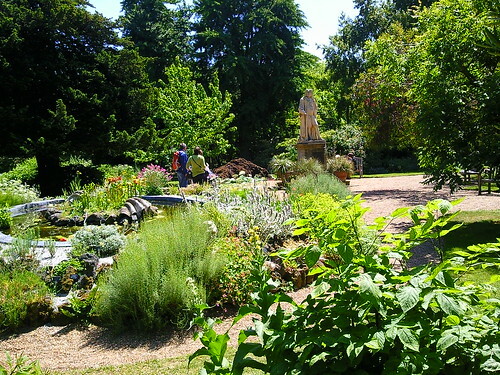 The tour that I had created included such fabulous gardens as the Chelsea Physic Garden, Kew, Sissinghurst, Wisley, The Great Dixter, Stourhead and other wonderfully gorgeous gardens. The gardens I visited were so wonderful that my friends have asked me to plan another such tour. I would love to return to England to see more gardens. I really wish I could live for an extended time in England to see every fantastic garden in England; but, alas, this will never be a reality. So when I to return to England to see more gardens, I want to know which gardens one MUST see, hopefully in a different part of England from the area I visited. To that end, I have been looking at lists of gardens on the Internet. But England has so many glorious-sounding gardens that I have to edit which to choose. So, after being inspired by Personal Opinion UK, TheGardenLady would like to get your opinions on garden suggestions in England. What is your personal opinion of the gardens people MUST see when visiting England? Why do you recommend these gardens? One garden I am considering is Rydal Mount and Garden, Wordsworth’s garden. Would you recommend this garden? Please, those of you who live in England or are garden visitors, let TheGardenLady and the readers of this column know which gardens in England you think absolutely should be visited. This information would be greatly appreciated. I look forward to hearing from you. I think the “Lost Gardens of Heligan” have an interesting history.